When you are invited to visit a brand new baby, you bring food for the parents. It’s just…necessary. Every time I do it, I’m surprised by just how necessary. Parents of a newborn typically hand over the tiny new addition then fall on the food like starved wild animals, forgoing niceties like utensils or reheating. It reminds me every time that taking care of a week or two old baby is so all-consuming that you not only don’t have time to cook, you don’t have time to remember you’re hungry. Before I gave birth, I had the idea that a simple roast chicken dinner was the thing to bring (I guess because it seemed like most other people would bring lasagna). But over the years, as my experience, and lack of time, have refined the notion, I’ve tended to bring just one hearty dish that is easy to eat. When my friend Amy had her first son, I made a quick sausage sauce for pasta, along with a salad. Less than 2 years later, she just gave birth to her second son, a gorgeous little tiny guy. 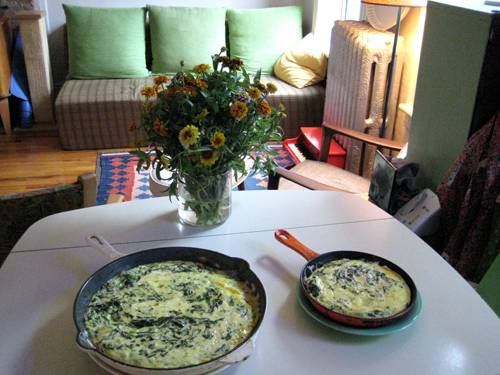 And because I’m currently cooking my way through Amanda Hesser’s Essential New York Times Cookbook, I have stumbled upon a keeper—something I will bring to new parents henceforth: Lidia Bastianich’s Swiss Chard and Scallion Frittata. 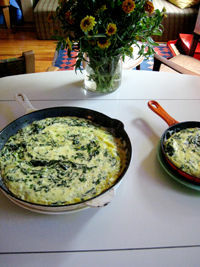 Full of protein from the eggs and ricotta and iron-rich thanks to the greens, this wholesome one-skillet meal is good at any temperature, and sturdy enough to grab with one hand and shove into your mouth. I doubled the recipe so we could eat it at home too, and I picked up some focaccia, as Hesser suggests, so that Amy would be able to eat this at room temperature in a sandwich, as soon as I brought it. Which she did.